When travelers think of Waco, Texas they usually find the name synonymous with the popular TV show, “Fixer Upper.” But there is much more to Waco than just Silos and the Magnolia brand. Waco is the site of a fossil dig containing the nation’s only evidence of a nursery herd of Columbian Mammoths. This discovery is now home to the Waco Mammoth National Monument, and it should be high on your list of things to do in Waco! 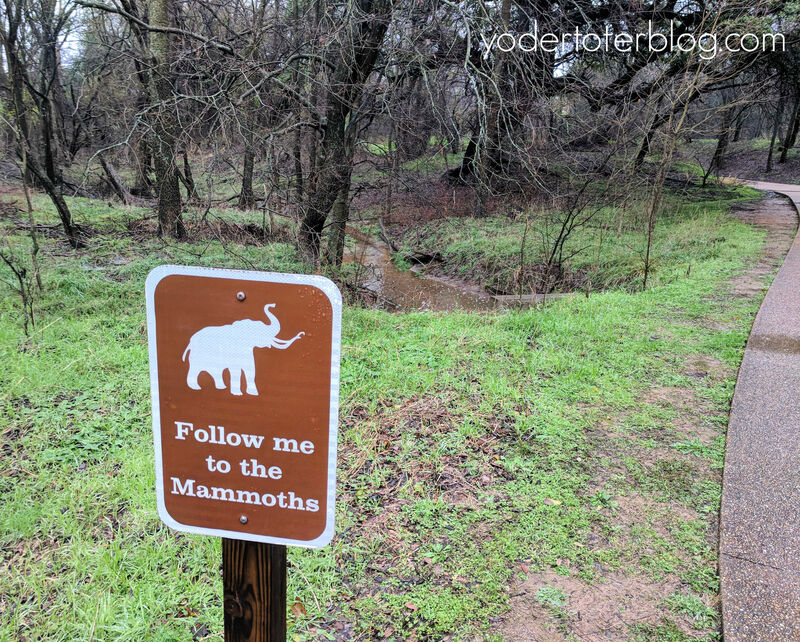 Before visiting the Waco Mammoth National Monument, I hadn’t heard of Columbian Mammoths. I only knew about their northern friends- the Woolly Mammoth. It turns out that the Columbian Mammoths lived from Texas all the way down to Costa Rica, and while they also lived during the Ice Age, the permafrost we think of only went as far south as Kansas. During this time, there were fewer trees in the region. Columbian Mammoths feasted on a Savannah-like grass and weighed nearly 20,000 pounds! Columbian Mammoths stood nearly 14-feet at the shoulder – much bigger than their Woolly counterparts. This discovery of fossils was found near a creek bed, which is no surprise considering the Columbian Mammoths drank nearly 25-75 gallons of water a DAY! (And to think, most of us are struggling to get our 8 glasses)? Your visit to the National Monument begins at the Visitor Center. Here is where you’ll purchase tickets for the tour and the kids get the booklets they need for the Jr. Ranger Program. The amount of work needed to complete the Jr. Ranger program is dependent on age. Our tour guide shared her expertise on the Columbian Mammoths as we made a short walk to the Dig Shelter. 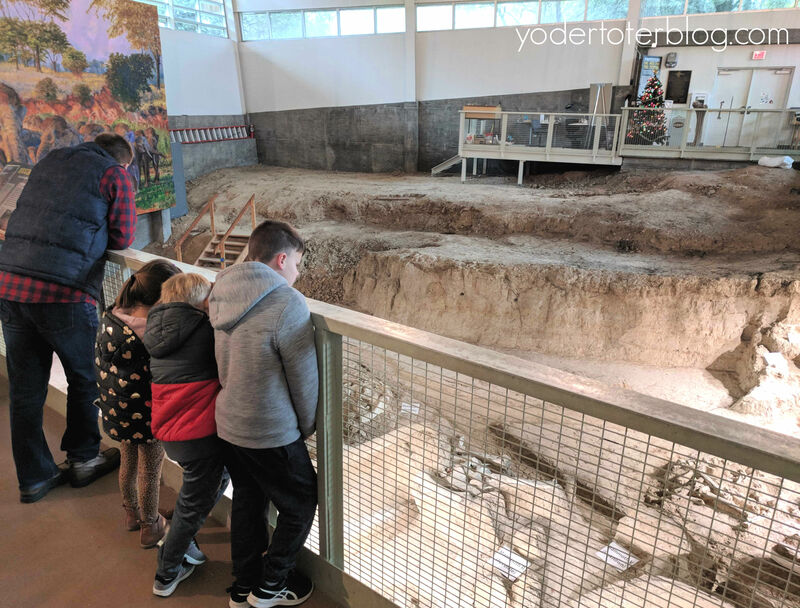 While many of the discovered fossils were moved to Baylor University, what you’ll be able to see are fossils that have been kept “in situ” – in their original position in the bone bed. The climate-controlled Dig Shelter allows the bones (and travelers) to stay out of the elements. While your tour guide is there to explain everything you’re seeing, you’re also free to roam about the building and explore on your own. Among the Columbian Mammoth fossils, you’ll also find the remains of a camel and the tooth of a saber-toothed cat! After helping the children complete their Jr. Ranger books, we walked back to the Visitor Center so they could show the Ranger. 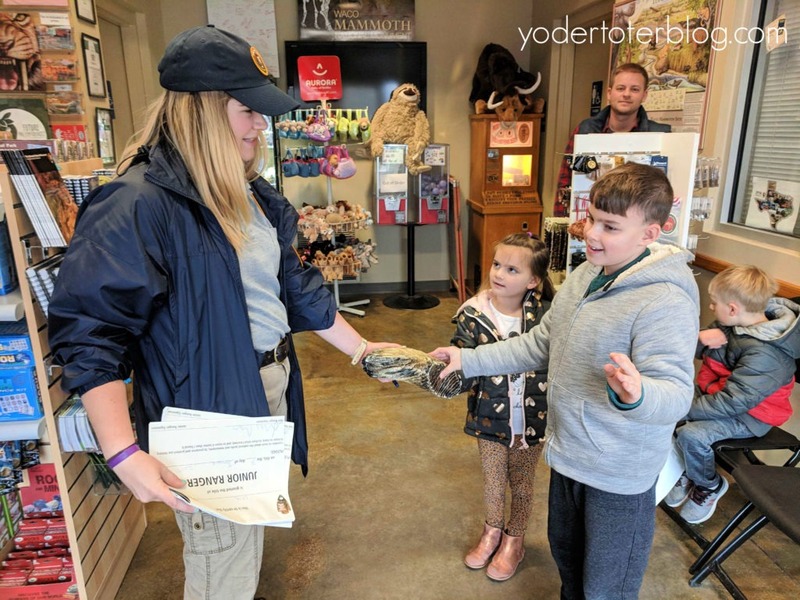 Swearing in on a fossil bone, two of our children successfully received their Jr. Ranger certificate. 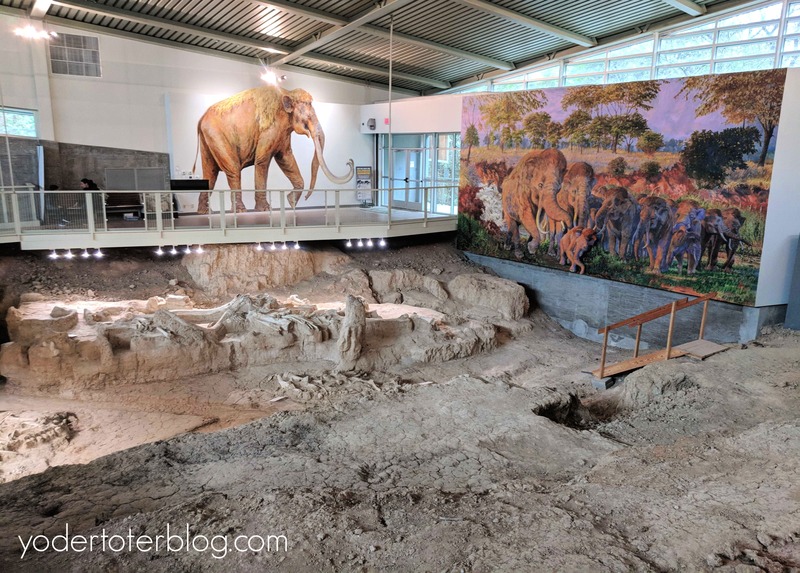 If you visit the Waco area, you’ll definitely want to save an hour or two to visit the Waco Mammoth National Monument. The kids (and the adults!) took away so much information on the lives of Columbian Mammoths during the Ice Age. I’m glad that President Obama declared this a National Monument so that our children’s children can enjoy the history of this paleontogical dig. The Waco Mammoth National Monument was stroller-friendly (and handicap-accessible). The walk from the Visitor Center to the Dig Shelter is only a 5-minute stroll. However, remember to dress for the weather for the short time you are outside. There were plenty of gifts and souvenirs at the Visitor Center, but no food is sold. If you’d like to bring a lunch, I did notice a couple of picnic tables. We stayed outside of Waco at the Springhill Suites Woodway. The hotel was perfect for our family of five and offered an indoor pool. Check rates HERE. If you are coming into Waco for the Magnolia Market, you can find out more HERE. Did you know there was more to see in Waco than just Chip & Jo? Share with me your trip plans for Waco!